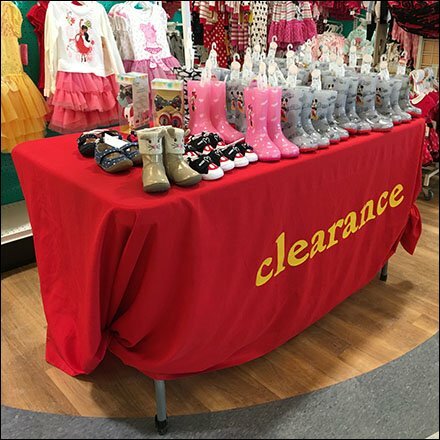 This Babies R Us Clearance Table Drape puts a focus on price as well as item seasonality. The discount approach is clearly stated for all to see. Many individual items are also clerancece tagged and priced to close the deal with browses quickly. Interesting that this Babies R Us Clearance Table Drape features some fairly fancy knots and drape ties. A nice bit of extra attention from the store staff.